It is the season for lots of things in my garden. Early Nicola potatoes, late broad beans, and asparagus at its peak. Most potato salads are traditionally dressed with mayonnaise, but I like to make mine with a vinaigrette. I made this riff on my basic potato salad with some extra ingredients. Steamed asparagus, double peeled broad beans, and dill in the mustardy vinaigrette. I also threw in some quartered cherry tomatoes for colour and some roasted almonds for crunch. This fancied up salad varies according to the season. This is one of the springtime versions, and a meal in itself. Steam the potatoes until they are tender when pierced with a sharp knife point. DO NOT overcook or undercook. If you are unsure, taste a piece. When the potatoes are cool enough to handle but still warm, peel the skin off and cut into slices into a large serving bowl. 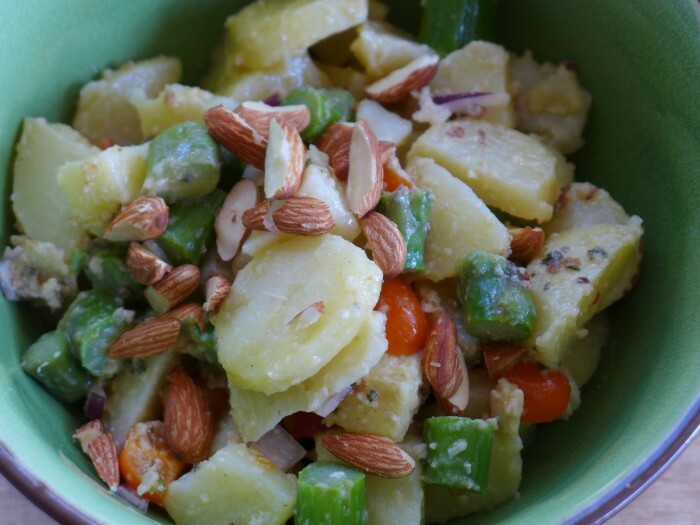 Add the almonds, asparagus, broad beans, and cherry tomatoes. Combine the remaining ingredients in a jar, put on the lid and shake vigorously to emulsify. Add as much of the dressing as you need to coat the potatoes and fold in gently so as not to break the potatoes. You will probably need about ¾ of the dressing. Chill the salad and serve. You can save the remainder of the dressing to use to refresh any leftover salad before serving.